Writing the Word, simple and effective, this written discipline has completely transformed my faith and will transform yours too! I stumble out of bed and tiptoe like a ninja out of our room to not wake the sleeping baby. Unfortunately, my tiptoeing doesn’t silence the creaky wood floors in the hallway where I’m met by a visitor. We make our way to the kitchen where I turn the coffee pot on, settle my early riser on the couch with an approved show and make my way to my desk. I have a small ritual I perform every morning before I sit with my piping hot cup of coffee and sit in God’s presence. First I light my candle. I don’t know what it is about the flame flickering and the gentle aroma of the fresh scent, but the lit candle helps create a sanctuary for me. Next, I power up my laptop but I have disciplined myself to go straight to Pandora to turn on my morning playlist and set the volume low. Adding to my morning sanctuary is gentle, soft music. My morning playlist is usually always from the Sara Groves or Sovereign Grace channels. I pull my Bible book basket off the shelf to retrieve my Bible, journal, pens, and highlighter. The other books and devotionals I will use later if time remains but my first priority is to get into the Word. Lastly, I open up the daily devotional on She Reads Truth to see what passages I am to read today. I sit in my chair with the journal set to a new page, my pen and highlighter ready to write and mark, the warm cup of coffee willing me awake and alert, and the gentle music and the flickering flame set the stage. My Bible open and my pen hits the paper to start writing out my daily letter to the Lord. Giving Him praise, offering up gratitude by listing my blessings, dumping out the thoughts in my brain to make room for the promises and truths He is about to fill. I write my prayers out in my journal. I connect with my Friend and Savior, making my heart and mind ready to take in His Words. As my eyes start to read the words in my Bible, I am compelled to write them down. Sometimes I write just a verse or two, other times I am transposing whole passages of Scripture in my journal. Depending on the words or what God is revealing to me, I write them word for word or I might paraphrase them into prayer from deep within. It doesn’t matter how I write, it’s the simple discipline of writing out the Word that is rapidly transforming my faith. When God’s Word is flowing through my pen and spilling out onto my paper it is no longer just a passive discipline to read the Word rather I am fully immersed in it. Writing is slower than reading so I am able to marinade on each word longer. Truths I may miss from a read through are being highlighted in my brain and written out to completely grasp the mystery of the Gospel. Some days I write a lot whereas other days I write a little, but there is no day when none of God’s Word is being written down. It’s a daily spiritual discipline that has drawn me closer to God. Writing the Word is bringing my heart and mind closer to the throne of God. Writing has been a passion of mine that has been reawakened to me in the previous years. It is something I feel called to do, especially here on this online space. 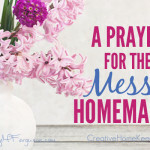 Sometimes my words are more practical bits of advice or homemaking tips, other times it is is lessons and truths God has firmly placed on my heart and to NOT write them out would be going against what He has called me to do. 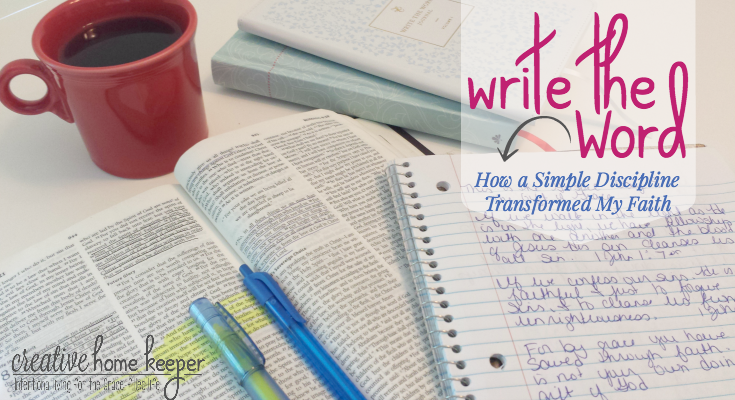 Writing the Word is not something I have always done consistently. In my prayer and faith journals I have recorded prayers and occasionally I would write out a passage or two along with a passage or quote I was moved by from a book or devotional. This year, however, something has changed. January 1st my third was born and it was the first of seven long days we would spend in the NICU. I felt alone during those long days and nights but I also found something else. 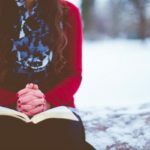 A few days earlier in December as I was sitting and making plans for the year and thinking through grace-based goals, I made the choice I would spend the year reading and studying the Bible through the She Reads Truth online studies. It was one of the best spiritual decisions I made for the year. Not because that ministry is the best one, although it’s pretty good, it was more the fact that they removed all the extra fluff from their daily readings so many other studies put in. It’s a passage with a short devotional but they outline studying the Word through three practices: She Studies, She Prays, She Lives. No prewritten study questions to guide my time in the Word. I was left with just my Bible and my pen. So I did the one thing that felt so natural at the time… I wrote out the Scripture passage. And you know what? God’s Word came more alive to me in that simple discipline than anything else I had done before. So I continued to write out His Words in my journal on a daily basis. I’ve been a Christian all my life but as mysterious as He is, He is able to capture our hearts in different seasons. This season He has drawn me closer to Him through written words. 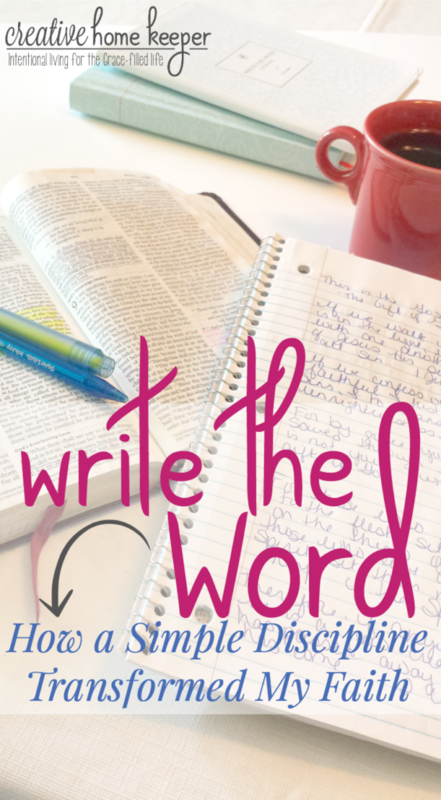 Do you write the Word on a consistent basis? If not, may I suggest you start? You don’t have to write out whole or long passages but just a verse or two to help you capture the main idea of what He is teaching you in your daily reading. Start in prayer as the foundation of your day and devotional time. Turn to the passage you are reading today (if you don’t have a reading plan you should really check out She Reads Truth. They also have a men’s version He Reads Truth too!) and start reading with a pen in hand. Let God lead you and write down anything you feel stirring your heart, whether that be a few words or the whole passage. Be creative, if you doodle, draw or paint let those creative energies flow into your writing. If you like different colored pens, highlighting, starring or marking, do that too. There are few rules in writing out the Word… only to write. Get started today and let this simple discipline transform your faith and your heart… like it has mine. I love this. It is a discipline to train our minds and bodies to sit in His presence and on the days when I’m most disciplined, I know that I am closer to Him and it brightens my day. There are seasons in life when I’ve had to “train” at different times in different ways, but early morning, that has always been the best. Thanks for sharing your moments. I agree that different seasons set different times for us. My baby is 7 months old now so for the first part of the year early morning quiet times just weren’t an option. Now that sleep is more consistent, it’s a habit I’m glad to back into. I do envy your morning routine; Victoria. I am not a morning person but i think i can always find the perfect time to just immerse myself in the Word of God. Thanks for this post. I recently read a post about someone who had their devotional time in the evening as way to unwind from the day and focus their mind on Jesus. I’m with you, I think we can always find the time to be in the Word but that doesn’t always mean it has to be first thing in the morning for everyone. Helen some of his instrumental music comes up a lot on the Sara Groves Pandora channel and I really like it! I also like to write out verses during my quiet times. Sometimes it’s something I’d like to use to memorise with my daughters, and sometimes it’s just something that strikes me in that particular moment. Melanie that’s so great you share Scripture with your girls. I can’t wait for my kids to be able to write because I would love to get them into the habit of writing out the word too. Andi, maybe just starting writing a verse or two when you are a reading a passage. It doesn’t have to be a lot, even a little can completely transform your heart. Sounds like a great routine. I struggle to find quiet uninterrupted time as my teenage son is an early riser and my teenage daughter a night owl. I used to do this a few years back. It is definitely a great idea to write God’s Word. Definitely good to have a routine. I love the peace and quiet in the morning. We have two little ones as well. I love this and I think it is a great idea!! I love this idea. Maybe it’s time for me to revisit the practice. Keeps coming up in my view. Hi Victoria…I recently discovered your site (via Brilliant Business Mums I think), and enjoy receiving your newsletters, and love your heart for God. This post has particularly inspired me. I’ve often journaled and written down what I’ve felt God speaking to me, but never thought to just write out scripture. I’m going to try it. I’m also hoping to link up to your Thursday link party sometime soon. Thanks for sharing your heart and love for Jesus. I have seen this post shared a few times this week and finally got over here to read it 😉 I used to write the Word in my journal along with the SRT lesson. But for some reason I stopped. You have reminded me how powerful it is, how it helps in remembering and also just really drives the point home instead of just skimming through. Thank you for the reminder to the importance of writing to the Lord! So glad you got a chance to read it Nannette! It’s such a simple discipline that has truly strengthened my faith and has made my daily devotional time so fulfilling. I just came across your blog. What a blessing! I started transcribing the Bible in 2010. I too am blessed by the experience of writing the Word. Thanks Teressa, that is so cool that you have been transcribing the entire Bible! I bet Scripture has become more alive to you as have done that! I love this, I write in my prayer journal in the morning and I try to write down reflections about what I read. However, I really like the idea of writing down at least one scripture each day.m sounds like a really great way to build this thing. Thank you for sharing. 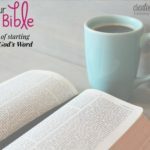 Thanks Tega, it really is such a simple discipline that has helped me dig deeper into the word even in this busy season of motherhood where I don’t have all the time to have long inductive Bible study times. Thanks! I never thought light the candle sometime I read the Bible in the morning and sometimes evening. I am not good writing because due of my hard of hearing but I am in college. I will write bible verse so I can understand. Have a blessed day! Bless you as you journey towards writing the Word. I pray that it will bless you, and the candle is so great. It’s one of my favorite parts of my morning routine! I’m a little late reading this post but had to jump in and say what a great article it is. There are a lot of great Bible studies out there…. but nothing beats just us and the Word of God and a journal full of His truth! Thanks for sharing your heart, I plan to share this on Facebook in hopes it might encourage other women to do the same as you are doing! Blessings to you! Awesome post, thank you! How do you determine which scriptures to read/write. The scriptures that I usually read are those connected to my daily devotion. This was beautiful, thank you for sharing your thoughts. I was just wondering how I can turn my daily devotional reading into something more…..more meaningful, more profound. I will read a days page, reflect on it, sometimes even post my thoughts about what I got out of it on my Facebook page. But it’s always quick to disappear, never re entering my mind again. I’ve been trying to figure out how to get more out of my spiritual morning moments to last longer, to remain in my mind throughout my day. This is inspiring and I’ll give it a try. Thank you. Thank you for this post! 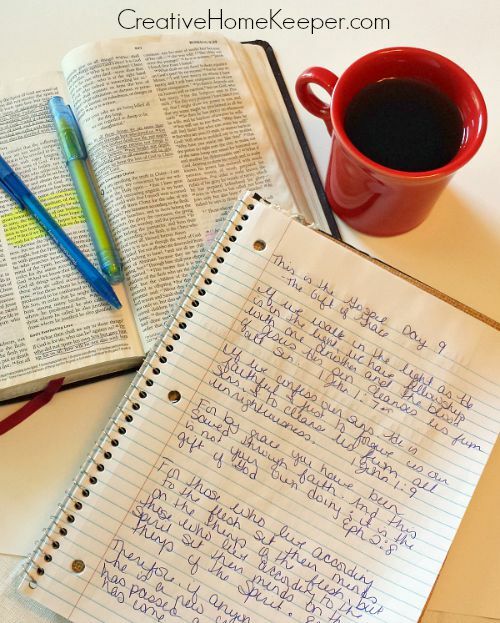 I have never written scripture… but your post has me motivated. I looked over the She Reads Truth sight you mentioned, and am excited to get started with it. So glad to hear that Jan! I love She Reads Truth, and I love they provide the Bible studies for free on their site as well so that way everyone can be in the Word. Thank you for all your information. I wish you and your family a healthy, happy and prosperous New Year. I am over 50 years old, and one of my earliest recollections is of my mother in worship. Seeing her in her house coat, in my dads tube socks, with a laptop and a hot drink. Her Bible, journal and her pen and pencil sat beside a box of tissues! It never failed, He would bring her to tears He would make her laugh. He gave her wisdom to be a beautiful mother, devoted wife, and an all-round wonderful person. Even with all the terrible things I did in my teen years, I was halted from doing the worst my curious mind was willing to entertain bcause I saw and heard her pray for all five of us kids every morning. Seldom is there a better gift you can give your child than for them to know that their parent walks with the Lord every morning in sweet communion. You brought back a beautiful memiry and reminded me of two of the greatest tool in our spiritual arsinal. Devotion and diligence to the training of the arm that whelds the sword of Truth and that hold the shield of Faith.. While it isn’t really Christian music, I absolutely love 2cellos. It is beautiful music and it makes my heart swell. I write out my prayers and have always wondered if writing them…like letters to God counts as prayer. It seems to be the only way I can focus on the act of praying and keeping my mind from flying all over the place. I do sometimes write down verses, but I don’t always do it. I think I will now! Thank you so much for your sweet words of encouragement Luisa! Blessings to you too! I am so thankful I found your blog! I just visited She Reads Truth, as I had pinned a post from them and you on my Pinterest board. I really relate to all you said in your post. I am also a writer, but haven’t made any time for it recently. I have all these wonderful new journals and notebooks that I won’t touch because I am afraid of “messing them up.” I’m going to grab one and dive right in! Thank you for sharing what has worked so well for you. Jan, thank you so much for sharing this! I used to be just like you too, afraid to mess up a pretty journal by writing in it, but now I go back through and read those “messy” journals of prayers and God’s Written word and my heart is so blessed! 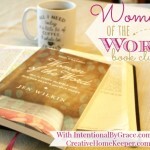 I’m so encouraged to hear you are embarking on the journey of writing His Word too! And good news… I am working on a Write the Word challenge for 2017 so stay tuned for a fun announcement in the new few weeks on the blog! I hope you have a very Merry Christmas! I read your article over a year ago, and I just stumbled across it again. I wanted to say that no practice has transformed my life more that simply writing out the scriptures and setting a morning devotional. It’s such a simple thing, but compared to my previous study that was based on just reading and highlighting in my scriptures , it is incredible how much more I, not only feel the Spirit, but actually remember scriptures at later times. Thank you! Thank you for changing my life and my study for the better! Simone, thank you so much for sharing that with me! It truly blessed my whole day to hear how this simple discipline has impacted your own faith as well! I’m so humbled that God used my words to strengthen your faith and time in the Word. Thank you so much for this. I pinned this quite some time ago, and have been doing this every now and then digitally in google notes, but I do enjoy the act of writing. It is how I etch things in my mind. I will be writing with pen and paper my take aways from my time spent in God’s Word. I have been wondering how to step/live deeper in His Word, and I know this is His answer. Thank you! God’s richest blessings for you and your family for the New Year. I’ve been doing this for years…writing out the Word as I read it and it has transformed my life. I’m 77 and have my devotions in the middle of the night…no interruptions and I am blessed because I can take naps in the daytime whenever I need to. We each have to find that time whether it’s in hours or minutes here and there…we just need to do it!